Conan/Red Sonja #1: "The Age of Innocence"
"Let me tell you of the days of high adventure." Conan the Barbarian is a holdover from a different age of storytelling: The age of pulp! Robert E. Howard had a long career writing for a number of different pulp magazines before a road trip through Texas inspired him to write a poem: "Cimmeria." The poem was the first inkling of the character that would then define his life and career, Conan the Barbarian, hero of the Hyborian Age, a lost age of fantasy. Conan wasn't a lost prince, though he would eventually take a throne by force, but a thief, warrior, and mercenary. He wasn't destined for great things; he took what he needed to survive and prosper. While Red Sonja wasn't created by Robert E. Howard - she was created by Roy Thomas for Marvel in the 1970s - she quickly became popular. Like Conan, Sonja was lowborn, a peasant who became a mercenary who became a warrior or renown. The two characters come from an era of adventure, a time when fantasy was less cynical and often more poetic. The Hyborian Age is larger than life, while fantasy storytelling has, for the last decade or more, been far more interested in playing in the mud. Conan/Red Sonja #1, a crossover between Dark Horse-owned Conan and Dynamite-owned Red Sonja, tries to find a middle ground between the two. The story features the two heroes as young, reckless mercenaries, both hired to steal a precious gem from the young son of a cruel king. Though they were hired separately, their paths quickly cross and lead them to team up and split the profits later. Little do they know, both were hired by a lackey of Thoth-Amon, a powerful sorcerer seeking a magical weapon of mass destruction, and what they're attempting to steal is the key to allowing him to murder on a scale previously unimagined. It's a classical fantasy hook - evil wizard, cruel king, young heroes - but writers Gail Simone (Red Sonja) and Jim Zub (Skullkickers) walk a tight rope. Lean too hard in one direction and you have a gritty story of amoral monsters casually ruining lives, a la the fantasy of Joe Abercrombie; lean in the other, and you have the weightless pulp where the stakes don't matter and the characters are interchangeable. Thankfully, Simone and Zub find a pretty good balance between the two. 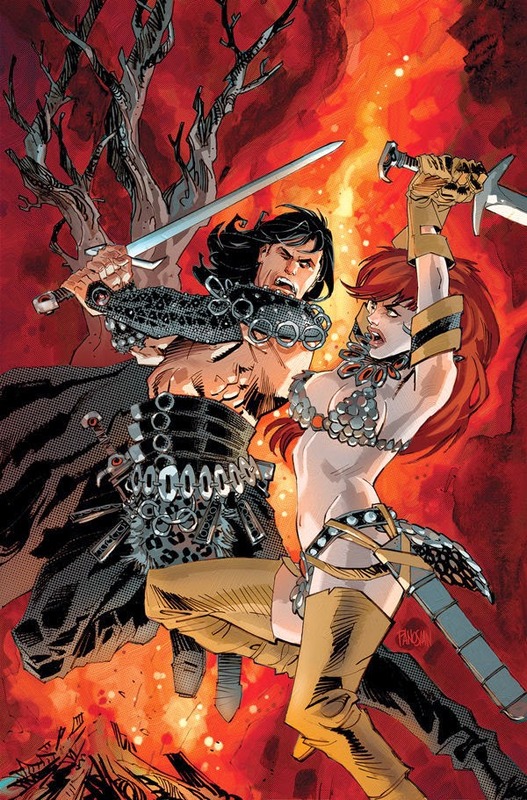 Both writers excel at fast-paced action adventure and character-driven comedy, and while Conan/Red Sonja #1 lacks the poeticism that helped make Howard's world so beloved, it's still a damn fine read. Simone has really got Sonja's voice down thanks to her time with the character on the Dynamite book, so I don't think it's a surprise that the issue spends most of its time with her; Conan, at least right now, is a more traditional fantasy mercenary, and I'll be looking forward to seeing how Simone and Zub build off that persona into the man of legends. They're joined by Dan Panosian and Dave Stewart on art. Panosian is phenomenal in his figure-work, particularly with Sonja. His characters' posture, in particular, manage to say a lot about who young Sonja and young Conan are at this stage of their lives without a lot of action or dialogue. Credit him this: You could read this entire book without looking at the words once and still enjoy the entire story, which is at once incredibly difficult to do and, in many ways, absolutely essential. It's just excellent work, and joined by Dave Stewart's reliably fantastic colors, here muted and earthy to set the toned-down fantasy of the story, you have one lovely looking book. Conan/Red Sonja #1 is not a fancy issue of comics. Indeed, in a narrative sense, it's basically all set-up - how do these two meet, what threat will they face in the coming issues. But it remains a well-paced issue with some strong character work and excellent art, an issue that should have fantasy readers hooked for the whole mini by issue's end. While Conan/Red Sonja #1 leaves room for improvement going forward, it's a gorgeous, well-made comic that sets up a promising story and delivers some solid character work. 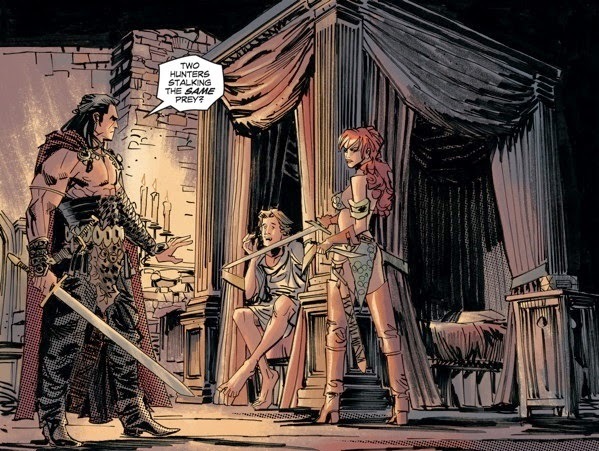 Conan/Red Sonja #1 was written by Gail Simone and Jim Zub, with art from Dan Panosian, colors from Dave Stewart, and letters by Richard Starkings and Comicraft. Published by Dark Horse and Dynamite, it will be released on January 14th, 2015, wherever comics are sold.